2018 Access Shade Sport 650. Picture credits - Access. Submit more pictures. Rating: Do you know this bike? Click here to rate it. We miss 2 votes to show the rating. Price as new (MSRP): Euro 7999. Prices depend on country, taxes, accessories, etc. Insurance costs Get a US insurance quote from Progressive. Parts finder Chaparral provides online schematics & OEM parts for the US. 2Wheels offers first time 2Wheels buyers $10.00 off now. Same day shipment to the US. Also check out our overview of motorcycle webshops at Bikez.info. 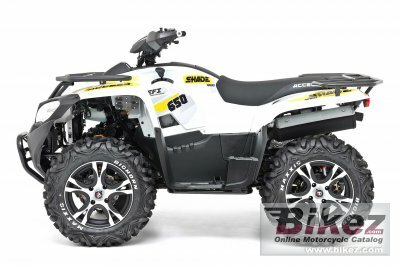 ATV parts Sixity.com sells ATV parts with free shipping to the US. Ask questions Join the 18 Access Shade Sport 650 discussion group or the general Access discussion group. Related bikes List related bikes for comparison of specs. Sell or buy used bikes? Bikez.biz has an efficient motorcycle classifieds. Ads are free. Click here to sell a used 2018 Access Shade Sport 650 or advertise any other MC for sale. You can list all 2018 Access Shade Sport 650 available and also sign up for e-mail notification when such bikes are advertised in the future. Bikez has a high number of users looking for used bikes. Before you buy this bike, you should view the list of related motorbikes Compare technical specs. Look at photos. And check out the rating of the bike's engine performance, repair costs, etc. Pictures, trademarks and logos of third parties are the exclusive property of the respective owners. Technical specifications are subject to change without notice. Bikez.com has been developed by low-cost software development company ObjectLabs.